Ailawadi is co-authoring a book on how marketers can develop strategies for their distribution channel during times of change. 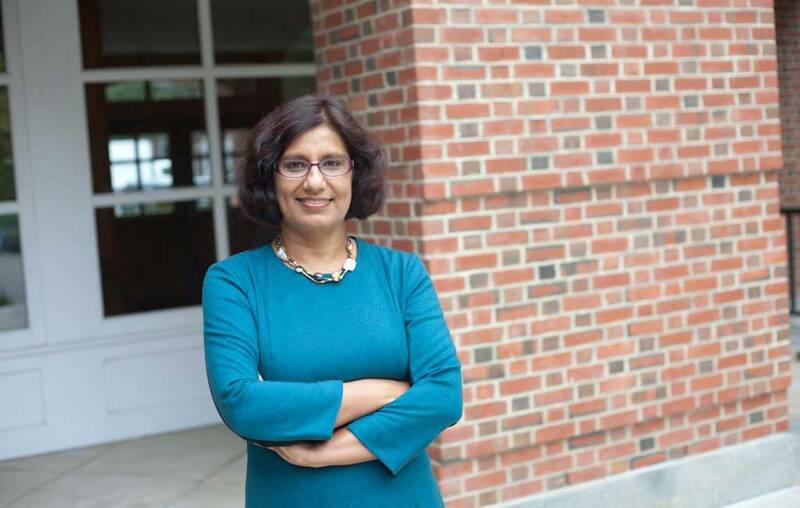 Kusum Ailawadi is the Charles Jordan 1911 TU’12 Professor of Marketing at Tuck. Her CV is stacked with dozens of highly cited academic journal articles, numerous awards for her research, a TedX talk, and contributions to publications such as the Wall Street Journal and Harvard Business Review. In the parlance of academia, she is a bona fide “thought leader.” And yet, she is modest and unassuming and can remember clearly a time when she was well-trained but not an expert on anything, when the world of research was opening up before her and she just had to take the first step. It was 1989, and Ailawadi was a Ph.D. student at the University of Virginia’s Darden School of Business. Her adviser was Paul Farris, the Landmark Communications Professor of Business Administration at Darden. He remains one of Ailawadi’s best mentors and friends, but back then he saw Ailawadi’s potential and jump-started her research career in two ways. “From day one, he had confidence in me, respected my intellect, and treated me like an equal,” Ailawadi recalls, “and that’s an important thing to have early in your career.” He also taught her how to ask research questions that are relevant to practice. “That’s exactly what I needed at the time,” she says. During the third year of Ailawadi’s Ph.D. studies, the Journal of Retailing invited Farris to write an editorial for an upcoming issue. At the time, academics and practitioners were grappling with the rise of mega-retailers like Walmart, and everyone lamented how much power retailers wielded over manufacturers. The feeling was that retailers could dictate terms to consumer-packaged-goods brands, demand all sorts of concessions and special promotions, and push their own private labels as well. Farris wasn’t so sure. He invited Ailawadi to check out the facts on retailer and manufacturer performance and write the editorial with him. The result was “Retail Power: Monster or Mouse,” which laid out four broad ideas backed by 20 years of margins, costs, and financial returns data, showing that plenty of forces constrained retailers’ power. They described the modern contours of the age-old relationship between brands and stores, and found it not to be radically changed. “Our work on that article formed the base for a lot of my thinking about the CPG industry, the interaction between manufacturers and retailers, the power struggle between them versus the partnership,” Ailawadi says. Out of that paper, which was Ailawadi’s first piece of widely cited research, new questions and issues arose, as did a hallmark of her work. Purveyors of conventional wisdom made unsubstantiated claims, and Ailawadi tested them with data. For example, people were speculating about the power of “private label” brands. So she studied how consumers who want good value choose between private labels (with their everyday low prices) and national brands (which offer promotions); whether retailers really earn higher margins on private label goods rather than national brands; whether private labels actually generate store loyalty among consumers; whether promotions are really bad for brands; and whether retailers really profit on them. “These were things people had strong opinions about but they had never been put to the empirical test. My work helped separate the nuanced reality from the myth and hyperbole,” she says. Many of these papers won best paper awards and other accolades. Much of this research was made possible by something Scott Neslin, the Albert Wesley Frey Professor of Marketing, introduced to Ailawadi when she arrived at Tuck in 1993: scanner data. In the late 1980s, researchers began to get access to the reams of data from retail checkout scanners, which sometimes had demographic data from customers with loyalty cards. “Scott and I did multiple projects together,” Ailawadi recalls. “He had a base in consumer promotions, which dovetailed nicely with my interest in the interaction between manufacturers and retailers and the balance of power.” She also credits Neslin with honing her ability to scope out a feasible research project and position it clearly. As Ailawadi began to focus on how her research could directly inform her teaching, it led her to design a new elective course. Introduced as Managing the Marketing Channel, it is now called Multichannel Route to Market Strategy. It began with her work on the CPG industry, but branched out to the broader world of distribution channels. How to reach end customers today is one of the biggest questions facing retailers and manufacturers, because there are so many options. Retailers can sell in brick-and-mortar stores and online. And brands themselves can open their own outlets and sell to consumers via their websites. Then there are two-sided platforms like TripAdvisor and Uber, which bring together supply from brands and demand from consumers and take a commission on transactions. Ailawadi has been studying these issues for a long time, and decided she had amassed a body of knowledge sufficient to write a practitioner-targeted book about them. She is co-authoring it with her original mentor, Paul Farris. “The book is intended to help marketers develop efficient and sustainable strategies for managing their distribution channel during times of significant change, and for anticipating and dealing with the conflict inevitably wrought by change,” she says. Ailawadi is bringing these insights and her writing into her elective and expects to complete the book in the next year or so. One of the cases she has written for her course, which she also features in the book, illustrates the beneficial role Tuck alumni can play in student learning. The story of Brooks Running Company was a perfect real-life example of a successful marketing strategy grounded in distribution. Coincidentally, the CEO of Brooks is Jim Weber T’86, whom Ailawadi invited to speak to her class. As told in Tuck Today in 2013, Weber took the helm at Brooks in 2001, when the company was struggling under the weight of its many footwear products. It was overstretched and had very little brand awareness or respect. Weber came in and, after much market research, decided to cut out 40 percent of the product line and focus on high-performance running shoes and the specialty stores that sell them. “From that, he slowly built the company’s quality, credibility, and brand up, and Brooks became the No. 1 performance running shoe company in the specialty running retail channel,” Ailawadi says. Weber has visited Ailawadi’s class a few times and they have collaborated on a case about the company’s turnaround. They now stay in regular communication, and Ailawadi continually updates the case to focus on the most current distribution issues facing the company in their multi-channel ecosystem. Ailawadi wants to bring marketplace data to bear on consumers’ food decision-making—and she wants to let the data speak for itself. In addition to her work on the book, Ailawadi’s research has expanded into the area of consumer health. Specifically, she has been investigating how marketing activities influence consumers’ grocery shopping and eating decisions. Again, her methodology is data-rich. But now, instead of only scanner data, she uses home-scan panels and information about families’ health and wellness. The homescan panel data comes from more than 100,000 households who have agreed to scan the barcodes of every grocery item they bring into their house, and it is augmented by survey data covering questions from household size and employment status to height and weight, exercise habits, disease prevalence, and usage of prescription medication. In 2013, Ailawadi published her first paper from this data, which looked at how households change their food shopping behavior when someone in the family is diagnosed with an obesity-related disease such as diabetes. She and her co-authors found, among other things, that “the consumption of sugar and carbohydrates decreases significantly in response to a diabetes diagnosis, but the intake of fat and sodium increases.” She has another paper, which is in the review process, that examines the impact of large warehouse club stores (such as Costco) on the quality and quantity of what people eat. Embedded in both of these projects is an analysis of how much consumers’ own self-control and health consciousness influence the foods they buy compared to the assortment, pricing, and promotion decisions of marketers. Her work, and the data she uses, have garnered attention from researchers in public health and nutrition who generally rely on food frequency questionnaires and diary recalls to track dietary habits of patients. She is now co-editing a special issue devoted to “Health and Marketing” for Marketing Science, the premier quantitative journal for marketing academics.